You've seen them on television, and now you're dying to see all the details of those gorgeous Rose Parade floats up close. Here's the first thing you need to know: Don't go to the parade. That's right, just don't go. That's because there's a much better way to get a good look at them and take their photos than standing on the street, trying to see around that tall person in front of you and holding your camera over everyone else's head. Instead, go to the Post Parade viewing, where you can see those artistic creations up close. After the Rose Parade ends, all of those fantastic floral masterpieces park near the end of the parade route. To keep them safe from harm, they're protected inside a fenced area. To see them, you pay a small admission fee. Once you're inside, you can get close to them (but please don't touch) and stay as long as you like. If you're curious and have questions, look for a volunteer who will be easy to recognize because they wear white coats and red ties. Admission to the float viewing is about as expensive as a night at the movies and children age 5 and under get in free. Float viewing (officially called Post Parade: A Showcase of Floats) starts mid-day after the parade ends: January 1 (January 2 if the first is on a Sunday) and continues the next day. The first afternoon after the parade is the most crowded time to go. If you would prefer not to be packed in with all those other gawkers, go on the day after the parade instead and get there when they open. You can also avoid crowds by being kind to someone else. Take a senior citizen or a disabled person with you, and you can get in two hours before the general public. Ticket lines get long at the gate and who wants to wait? Buy tickets online before you go and avoid that long delay when you're anxious to get in. You can't bring pets into the viewing area. Of course, assistance animals are permitted. You can bike to the gate, but can't take your bicycle inside. You can't go in on roller skates, Segways, scooters, or skateboards, either. All strollers, backpacks, purses, bags and the like will be searched as you enter. Food and drink options are limited. You can bring small quantities of food and non-alcoholic drinks with you—but no big coolers. Pick up a paper map at the entrance. It will show you the locations of all the floats. If you're bringing baby, you need to know that strollers can be hard to manage because of crowds and uneven terrain. Wagons are not allowed. If you view all the floats, you'll walk about 2.5 miles, and it will take at least two hours. You'll be happy you wore your comfortable shoes and brought your hat and sunglasses by the time you're done. American Sign Language interpreters are available for hearing impaired guests. Ask about them at the entry gate. If you also want to watch the floats being put together, here's how to see the pre-parade float decorating. 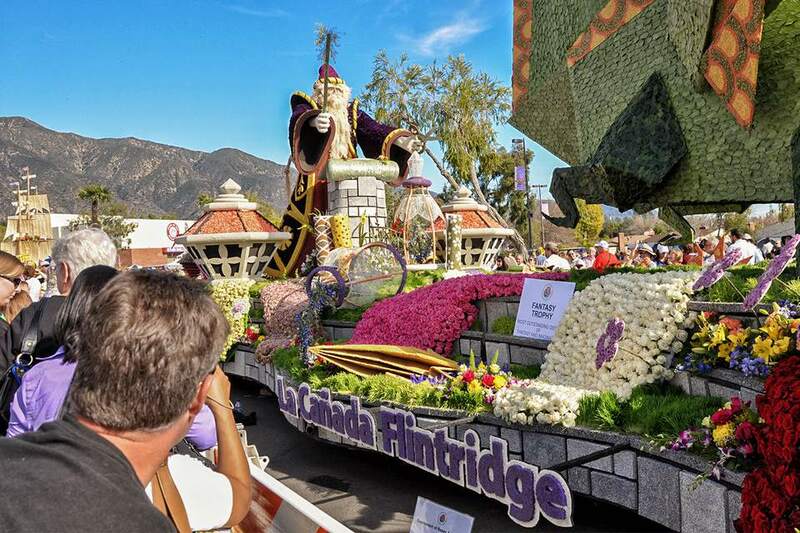 To find out about options for watching the parade in person or enjoying other Rose Parade events, check the complete guide to the Rose Parade. The easiest way to get to the viewing area is to take a Park and Ride Shuttle from any of the Pasadena location listed here. On January 1 and 2, you can also take the Metro Gold Line to the Sierra Madre station, where you can catch the shuttle. The ride costs a few dollars per person (kids 5 and under are free). To make this option even more attractive, shuttle riders get to use a priority entrance when they arrive. If you have a car full of people and don't mind walking a bit, it may be less expensive to try one of the paid lots near Pasadena High School. Ridesharing services are also an option. If you need more information about the post parade event, you can find it on the Rose Parade website.